If the company in general is a victim of a culture of the image, the architecture is not foreign to this phenomenon. Much might be spoken about the photography of the architecture as paradigm of this trend, but without leaving of the own elements of the built-up world, it is the front the one that assumes this visual paper. Inside this dynamics, many they are the architects who resort to collaborations with artists to try to amplify the expressive and conceptual load of the fronts of his buildings. 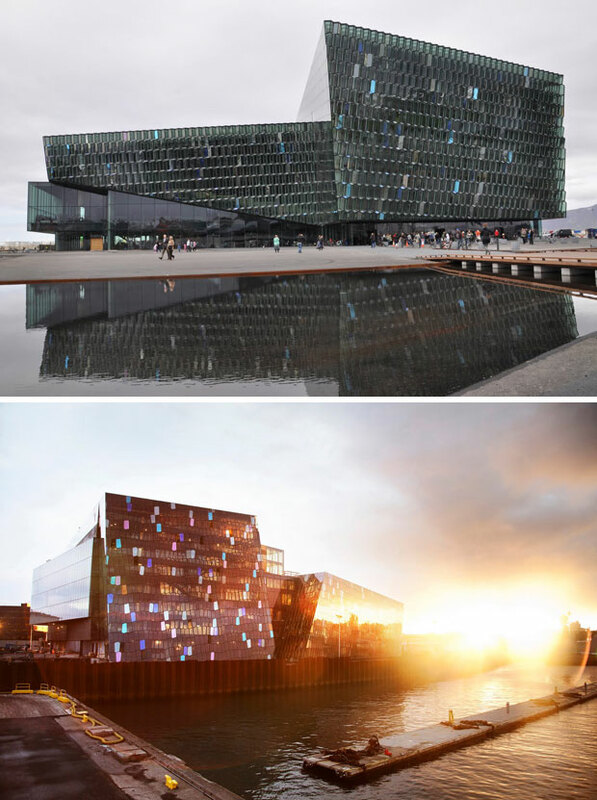 During this August the Audience and Center of Conventions has inaugurated Harpa in the Icelandic capital, Reykjavik. 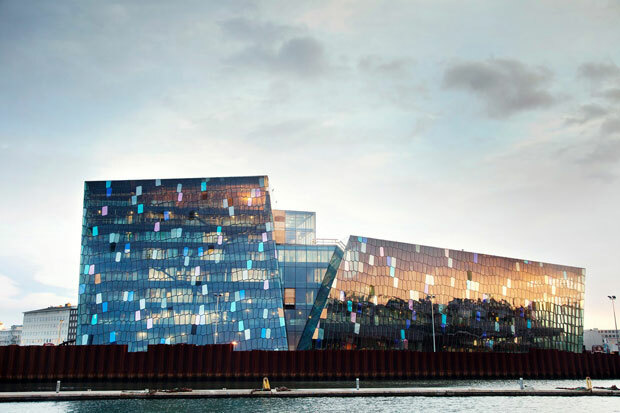 The project of urban regeneration and extension of the area this one of the port of Reykjavik was presenting as his principal element tractor and icónico this new center of congresses. 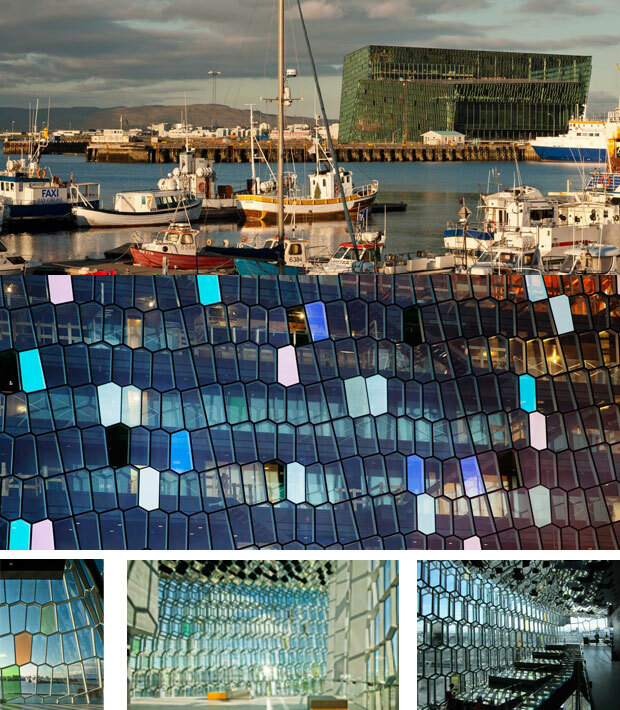 The disastrous economic situation of Iceland and his later bankruptcy in 2008 did that the management of the project was happening from hands deprived to hands of the public administration, what Danish Henning Larsen Architects forced the equipment of architecture to collaborate with local professionals between whom the artist stands out Danish – Icelander Olafur Eliasson. The general intention of the urban plan was it of transforming this zone of the city, and to turn her into new center capable of revitalizing the economy. The construction of a great square surrounded with commercial districts and with offices, residential buildings and educational institutions, there would generate a new dynamic neighborhood and young person opened for the business. The new Audience Harp, it would turn this way into the urban modal since his impressive situation in the coastal limit together with his powerful silhouette they would modify the urban image of the area. Henning Larsen resorted to the dialog with the local nature to establish the principal ideas of the project, this way four rooms of the building are organized in closed volumes which forms remember the volcanic mountains that surround the city and that form the imaginary group of the inhabitants of Reykjavik. Three minor rooms are opened towards the south side of the building, whereas in the north side there place the complementary, such services as offices, rooms of test and wardrobes and the zones of load and unload. In the center of these two areas one finds the principal room of concerts with a capacity of 1.800 armchairs. The rooms refer to the only elements of the Icelandic, like that nature if the room of concerts with his red intense color relates to the volcanic craters of the island, the geometry of other one of the rooms reproduces that of the crystal silfburger, a transparent crystal of calcita that only can be in Iceland. In a country like Iceland the nature is not only an ecological or environmental value, but one possesses component equivalent to the cultural heritage of countries as Greece or Italy. For this motive the polar light of the north, the ocean, the volcanoes and the lava or the radiance of the sky were brought as motives of integration by the artist Olafur Eliasson to the front of the Harp. 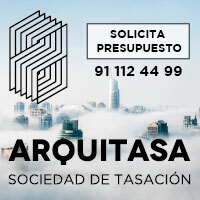 The complex glazed geometries of the building multiply with his angulaciones the reflections generating a changeable expression according to the visual angle, which provides infinity of perceptions. Constructed with different types of glasses and steel, from a modular system of polyhedrons of twelve sides inspired by the formations of basaltic rocks of the island, they compose a kaleidoscopic game of colors. In the south, a composition of more than 1.000 modules captures and reflects the natural light, changing drastically the transparency, the capacity of reflection and the color of the front as they change the stations. In the rest of the sides, the three-dimensional system simplifies, which gives place to flat fronts of polygons of five or six sides, which play with the reflections of the water, the squares of access or the ships of the nearby wharves. Reality like that makes Eliasson’s idea to itself, of desmaterializar the building as static entity and provide it with life, to answer to the changeable own color of the latitudes of the north in which the low light is loaded with blue or reddish colors depending on the hour and the epoch of the year. This new center of conferences that seeks to symbolize the renewed dynamism of Iceland, presents nevertheless a contradiction as minimum showy. The plant and the interior geometry of the building, as well as that of the rooms might qualify of correct, even of classic, which contrasts with the elaborated front. It would seem that to a functional standard scheme, adapted correctly by Larsen’s office to the determining local concrete ones Olafur Eliasson had added a garment of show, a face that it tries to surprise. 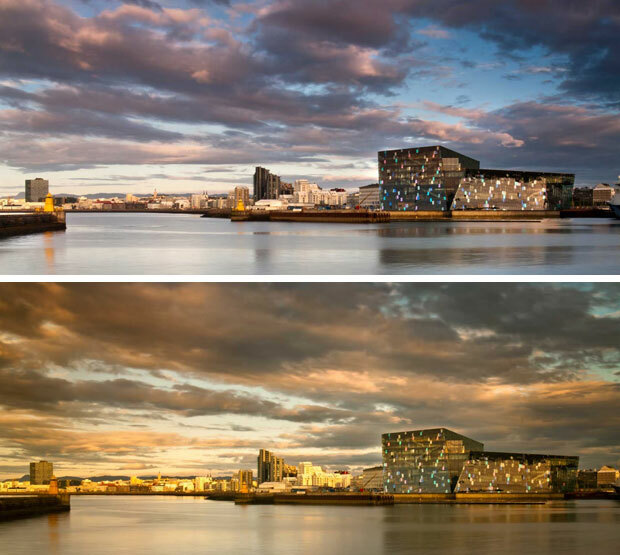 The intervention of the Eliasson might be considered in this case cosmetics, though in a building allegedly innovative the front is the only element that answers to this question, leaving quite the expressive and conceptual load to this element. If the face is the reflection of the soul, the front it should be of the building, though in maybe too many occasions it seems that the whole architecture diminishing to an epidermal and superficial question, reducing to an image the whole essence of the constructed work.